Anita Marie Thompson was born February 16, 1936 to Malcom and Gladys McRae in Bellingham, Washington. As a young child, she moved with her family to Seattle, where she attended Trinity Lutheran Church and School. Anita was baptized and confirmed at Trinity. She began her high school years at Garfield High School in Seattle. As a teenager, Anita often worked as a live-in nanny while also going to school. When her family moved to Tacoma, Anita began attending Lincoln High School. This would prove fateful, when, as a junior, she sat next to a very handsome boy in Mr. Schwartz’s Civics class. Bud was a sports star at Lincoln. Within the year Anita and Bud drove to Coeur d’Alene, Idaho and eloped at the Hitching Post Wedding Chapel. They would remain married for the next 65 years. Anita would have been in the graduating class of 1954, but left school to become a housewife. In time she earned her GED. Anita and Bud’s union was blessed with eight children. Anita’s mother was deaf, and Anita became fluent in American Sign Language. As an adult she would serve as a deaf interpreter when asked, and she taught ASL to children at Vacation Bible School. Anita was very active in the lives of her children. She participated in the PTA and was a room mom at her children’s schools. She was an adult leader in Cub Scouts, Blue Birds and Camp Fire Girls. When the youngest of her children was old enough for school, Anita went to work for the Roman Meal Company, where she worked for many happy years. She carried many happy memories from there. She also worked for Hill Haven Nursing Care Center, and then American Home Patient, where she enjoyed working with her niece Debbie. Anita volunteered at Tacoma General Hospital, and also made quilts for the homeless and others at her long time church, Grace Lutheran in Tacoma. 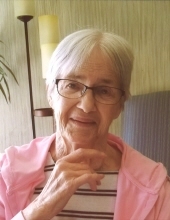 Anita passed peacefully into God’s eternal life and care, surrounded by her family, on Sunday, November 11, 2018. She was preceded in death by her parents, Malcom and Gladys McRae, brother Mac, sisters Shirley and Joan, son Michael, and daughter-in-law Cathy. She is survived by her husband Armand (Bud) Thompson Jr., children: Gail (Glenn) Noble, Dale ( Cathy 2014) Thompson, Pam Schuchmann (Sam Bruno), Marvin (Kim) Thompson, Larry (Theresa) Thompson, daughter-in-law Karen Mills Thompson ( Michael Thompson 1997), Brian (Denice) Thompson, Armand (Barbara) Thompson III (Andy), 18 Grandchildren, 11 Great-grandchildren, and numerous nieces and nephews. She loved them all very much. Anita and Bud were long time members of Grace Lutheran Church, Tacoma with Pastor Richard Tietjen until the church closed. They then became members of Trinity Lutheran Church, Tacoma with Pastor Jeffery Gaustad. The family appreciates the special time they both spent with her and our family. Thank you. The family also wishes to give a special thank you to Tacoma Lutheran Retirement Community, especially the Alpine wing, and Hospice. The care they gave to Anita and to her family was truly a blessing. To send flowers or a remembrance gift to the family of Anita M. Thompson, please visit our Tribute Store. "Email Address" would like to share the life celebration of Anita M. Thompson. Click on the "link" to go to share a favorite memory or leave a condolence message for the family.